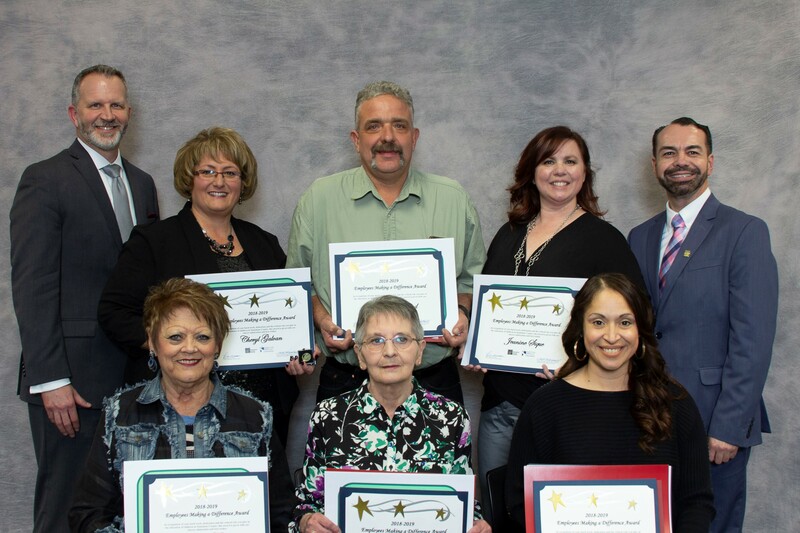 This year, the Stanislaus County Office of Education (SCOE) and the Association of California School Administrators (ACSA) Region VII partnered to honor outstanding classified (non-supervisory) education employees in Stanislaus County. Called “Employees Making a Difference,” school districts throughout the county selected their own honorees and forwarded nominations to SCOE. Twenty-two outstanding classified staff were honored at a special reception on Monday, January 14, at the Martin G. Petersen Event Center, and six honorees were selected to represent Stanislaus County in the California Department of Education’s statewide recognition program. The six representatives (one from each work-category) announced were: Brigid Olson, Somerset Middle School of Sylvan Union District, Child Nutrition category; Anita Theiler, Cloverland Elementary of Oakdale Unified, Para-Educator & Instructional Aide category; Vernon Wheeland, Ceres Unified School District, Maintenance/Operations category; Jeanine Sique, Waterford Unified School District, Support/Security Services category; Lorena Rodriguez-Daniel, Empire Union School of Empire Union School District, Office & Technical category; and Cheryl Galvan, Riverbank Unified School District, Transportation category. CHILD NUTRITION – Brigid Olson, Lead Speed Line Worker at Somerset Middle School in the Sylvan Union School District, has been serving students for 38 years. Brigid always makes the extra effort to ensure that all students are receiving the best possible breakfast and lunch daily. Every student that goes through the cafeteria is forever touched by Brigid. We know this is true because her boss, Michael Maaske, was once a student at Somerset and is proud to acknowledge that she takes all the credit for teaching him everything he knows. We are proud to honor her as an Employee Who Makes a Difference, even if that honor takes second place to when the student body dedicated the Yearbook to her. Please join me in congratulating Brigid Olson. MAINTENANCE/OPERATIONS – Vernon Wheeland has moved through the ranks of the Maintenance Department in the Ceres Unified School District for the last 16 years. His tremendous knowledge pertaining to the maintenance of each school site is invaluable. Vernon is always willing to go above and beyond and is currently pursuing his Water Treatment Certification so that every sip of water at a Ceres school is the “purest drink” a student has all day. Vernon pays attention to the details and is dedicated to maintaining sites that are safe and provide the best learning environment. Please join me in honoring Vernon Wheeland. PARA-EDUCATOR & INSTRUCTIONAL AIDE– Anita Theiler has worked for 44 years – can we stop right there, and acknowledge 44 years! - as an instructional aide and has been in her current position as an aide in a Special Day Classroom for more than 20 years. Currently, she is working at Cloverland Elementary School in the Oakdale Joint Unified School District. She is an unsung hero, assisting students with their Science Fair projects, supporting them in the classroom, chaperoning on field trips, or providing a listening ear and a compassionate shoulder for students who need them. She ensures that students have coats, toothbrushes, food to eat, and money for camp. Anita Theiler makes a difference, even though she mistakenly says, “I am just doing my part.” She is an exceptional human being who cares for everyone around her. Join me in congratulating Anita Theiler! SUPPORT/SECURITY SERVICES- Jeanine Sique has served Waterford Unified School District in various capacities: health clerk, clerk typist, and now Behavior Support Program Assistant. She is unwavering in her dedication to ensuring that all students meet or exceed standards, and she never leaves the “underdog” behind. Jeanine took it upon herself to become a registered Behavior Technician, and, now, she has been a strong voice for change for students with behaviors, and she works to support them. Away from school, she volunteers at Memorial Hospital working with cancer patients and she is a member of the Tri-W Woman’s Club. Jeanine takes pride in ensuring that Waterford students are safe, valued and supported, regardless of their social economic status or ethnic background. If there is a list of employees who make a difference, Jeanine Sique is at the top! OFFICE AND TECHNICAL – – Lorena Rodriguez-Daniel is a five-year veteran in the position of Principal’s Secretary at Empire Elementary School and as such has had a measurable impact. Lorena is dependable, positive, efficient, and accurate. She is an ASB co-advisor, and a member of the School Site and Classified Employee Councils. Beyond this, however, she founded the Empire Running Club for students and currently has 39 participants, many of whom had – emphasis on the “had” - poor attendance, low grades and personal struggles. She leads weekly practices and encourages students to participate in local races. To date, she has had runners in 8 different races. And she has impacted high school students as well through her involvement in Teens Run Modesto. We appreciate you, Lorena Rodriguez-Daniel, for your intentional efforts towards making a difference in young people’s lives. TRANSPORTATION- Cheryl Galvan far exceeds her title as “Bus Driver” for the Riverbank Unified School District. During her 22 years with the district she has demonstrated her knowledge and high skills of the job during everyday bus drive and also during emergency and stressful situations. She is committed to the students and demonstrates this by her emphasis on safety on the bus. She willingly promotes collaboration with the school sites. Cheryl’s community involvement is unrivaled. She is a cheerleader for students in the stands who may have no one else to cheer for them. She buys food for hungry students and on numerous occasions has made meals for the entire team to take on an athletic trip. When you see Riverbank Unified’s award winning decorated bus in the Christmas parade know that Cheryl is the one who made sure it was “just right.” Please join me in recognizing Cheryl Galvan.